This was a phenomenal meal. It's nice, on a Sunday night every once in awhile, to spend an extra twenty minutes on dinner, and I feel like this was the perfect occasion to do that. Breaking out the grill for the first time since last year provided a nice occasion for that sort of care. We broke out the grill for the first time since last year, we had marvelous fresh beets and fennel to use up, it was such a beautiful evening. In a way, it was the perfect last meal of spring and first meal of summertime, all on one plate. By way of plot summary: there are many steps here, but they are all very easy. This recipe does make a lot of dishes, but in terms of time commitment, so many of the steps overlap that everything can be done in the time it takes to cook the barley. Cook the barley Cook 1 cup pearled barley in 3 cups water and 1/2 tsp salt at a low simmer for about 35 minutes. Remove from the heat and let sit another 10 minutes with the lid on. Drain off any excess water. Toast the walnuts Heat a dry skillet over medium heat, and toss the walnuts around until they start to brown and smell walnutty. Blanch the greens Wash and stem the beet greens, and tear into bite-size pieces. Fill half your sink with very very cold water (throw in ice cubes for extra points. Heat a large saucepan of water to a spirited boil, throw in all the greens, stir once, then just as quickly drain and transfer the greens to the ice water bath. They should look green and awesome. Assemble: Pile a little cooked barley onto a plate, followed by some beet greens. 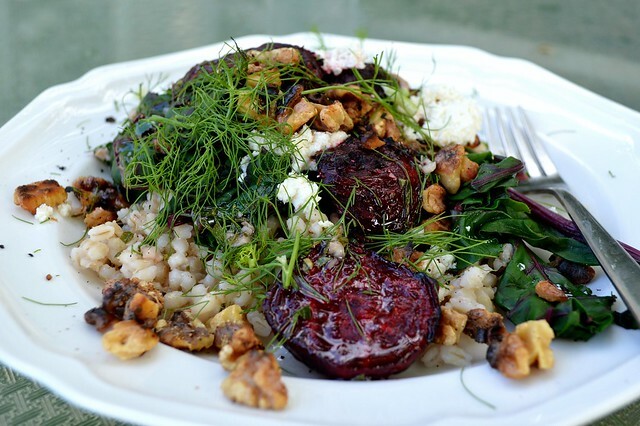 Drizzle with vinaigrette, top with grilled beets and fennel, and sprinkle with walnuts, feta and minced fennel fronds (if you got 'em). Love life. And now for me, it's back to cleaning. Gotta get this house ready some way, some how! How totally gorgeous! Before I realized those were fennel fronds I thought it was a whole mess of dill, which would also be divine. You make me long for the country, my friend. You're welcome to visit anytime. I mean it.